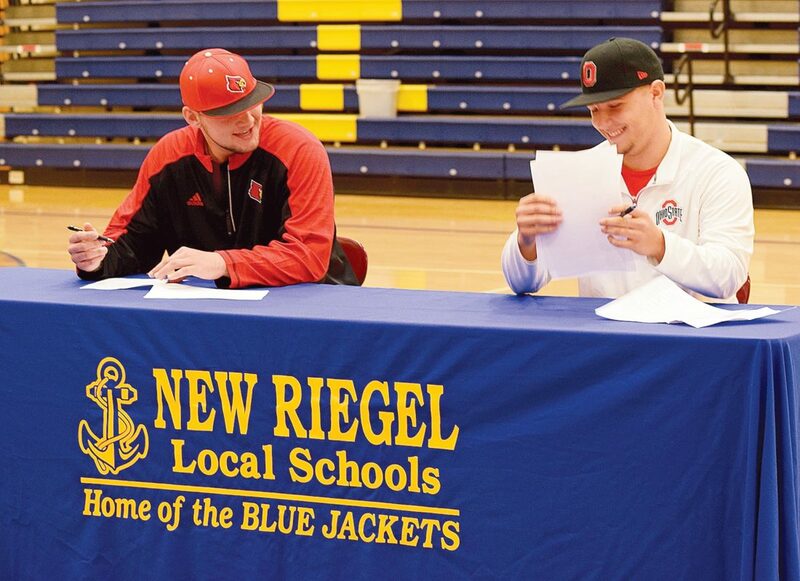 PHOTO BY JILL GOSCHE New Riegel High School seniors Michael Kirian (left), who is going to play baseball at University of Louisville, and Alex Theis, who is going to play baseball at Ohio State University, prepare to sign national letters of intent in the school gymnasium Wednesday morning. To view more photos from this event, visit cu.advertiser-tribune.com. NEW RIEGEL — Jamie Lininger, New Riegel’s athletic director, had a speech prepared Tuesday. Lininger addressed an assembly of high school students, and in his remarks, tried to explain to them the unlikelihood of what had occurred. Two athletes, from the same class, on the same high school baseball team. Both left-handed pitchers. Both about to sign letters of intents to play at Division I colleges. It is pretty impressive.New Riegel senior Michael Kirian has signed to play baseball at Louisville. His teammate and friend, Alex Theis, signed to join Ohio State. “Right now, the main thing going through my mind is how excited I am to officially be signed and be a part of the University of Louisville baseball program,” Kirian said. Both players have endured challenges to get to this point. Each missed their junior seasons after suffering ACL tears. Both have recovered, although Theis is not expected to pitch this season after undergoing Tommy John surgery in August. The pair helped New Riegel win a district title in 2015. For Kirian, deciding on Louisville came after making several visits to the campus. Kirian said he didn’t get too down after his injury last year. For Theis, he said the signing with Ohio State is a dream come true. “It’s just been a dream to be a Buckeye my whole life,” Theis said. “It’s my passion, just something that drives me. Theis said he got plenty of support when he was hurt, which strengthened his resolve. New Riegel baseball coach Greg Hughes said Kirian and Theis have done something remarkable. Kirian said it was a special moment to sign a letter of intent at the same time his teammate did.